I AM YOUR WISE FACE. YOU ARE MY NEW-TOOTH SMILE. It is a beautiful spring day, and a grandmother and toddler teddy bear set out to spend a day together, celebrating what each brings to the relationship in quatrains which compare and contrast, in poetic metaphors, the differences and the family ties between the generations. In her sequel to her highly popular You Are My I Love You, Maryann Cosimano Love shows a fun-loving and sturdy grandmother as the two approach their outing in their different ways. Grandma waits patiently for a fish to bite her line, while the youngster happily chases a butterfly with his fishing pole; she admires the fountain and he splish-splashes in the water; she swings him high over her head, while he spreads his arms and soars like an airplane. And at last both of them run out of energy and so it's time for a quiet song on Grandma's guitar, a story, and a well-deserved rest. I AM YOUR ROCKING CHAIR. YOU ARE MY SNUGGLED DEEP. I AM YOUR GOODNIGHT PRAYER. YOU ARE MY FAST ASLEEP. 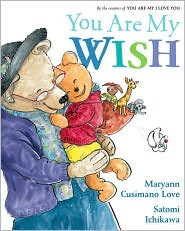 Maryann Cusimano Love's latest, You Are My Wish (Philomel, 2010) is a sweet look at cross-generational love and fun, illustrated in Satori Ichikawa's lovely soft pastel water-colored paintings that are so appealing to the eye.